The Spectrem Group study The Retirement Income Gap Solution studies the attitudes of retirees as well as investors within three years of retirement as they look at their retirement income. Among the 31 percent not using an advisor, almost half said they are not using one because their financial plans are in order and need no adjustment. Sixty-six percent of retirement investors said the advice they received was either “excellent” or “very good. Among the working households, 85 percent said their advisor rated ‘excellent’ or “very good’’ in terms of satisfaction of the investor. Only 2 percent reported a rating below ‘satisfactory”. Fifty eight percent of the working households reported their advisor’s responsiveness to requests as “excellent” and 50 percent said their advisors were “excellent’’ in terms of knowledge and expertise. Fifty-five percent of retired investors continue to work with the advisor they had before retirement. Fourteen percent have changed advisors upon retirement, and 31 percent say they do not use an advisor in retirement. Among working households, 40 percent of investors use a financial advisor for both investments and income planning for retirement. Seventeen percent use advisors regarding investments and only 5 percent are only using an advisor for retirement income planning. Thirty-eight percent said they are not using a financial advisor for either of those purposes. 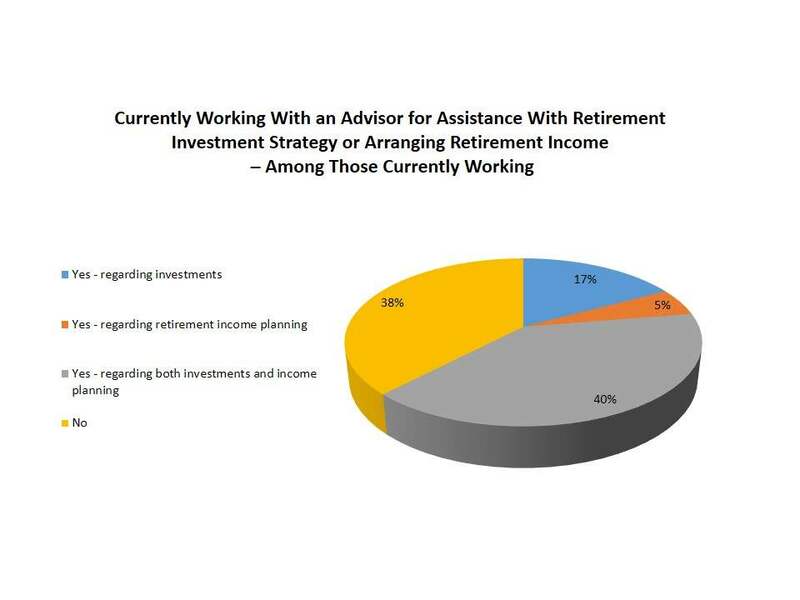 Among retired investors, 43 percent worked with an advisor on investments and retirement income planning, 26 percent used an advisor for investments and only 2 percent used an advisor only for retirement income planning. Twenty-nine percent did not use an advisor at all.